In her article "Even Geniuses Work Hard," Carol Dweck explains that those with a fixed mindset believe that "intelligence is simply an inborn trait," like eye or hair color. People are born with a certain amount and no one can change it. Like a cup, some are different sizes, but once the cup is full, nothing else will fit in. Therefore, once you reach a certain age or achieve a certain amount of knowledge, you're done - no need to learn anything else because it will just flow out of the cup. On the other hand, if you have a growth mindset, you believe that intelligence is ever-capable of expanding. Like a river, it can continue to grow in depth and breadth, changing the landscape as it goes. 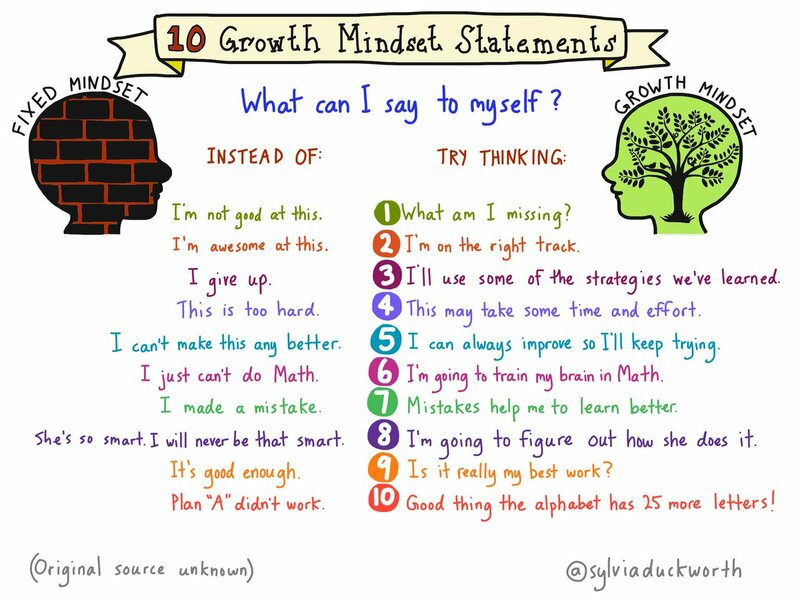 But students aren't the only ones who need to believe in a growth mindset. Too often, teachers will say "Spelling was never my thing," or "I'm no good with math," or (my favorite) "I'm too old for technology." How do we expect our students to believe that they can continue to learn when all we as teachers model is that learning stops at certain point? Especially when that STOP point is something that we find difficult? They need to see that the challenge is what is important, and that without challenge, there is no real success. Grit is a personality trait that has to be developed alongside a growth mindset. Competitive athletes don't become competitive and win championships by quitting when it gets difficult. Instead, they keep pushing. They fail and fail and fail and fail until FINALLY, they succeed. And then, they push for the next level. That's what we expect our students to do. We push them through formative assessments in class and for homework. Often, they fail. But we keep pushing and asking more until finally, when they take the summative, (we hope!!) they succeed. If you're still reading and wondering about ways to promote a growth mindset in your class or in your own life, Vicki Davis (also known as Cool Cat Teacher) recently published a blog listing a myriad of ways that you can bring this to life in your classroom. Regardless of your learning style, you will find a way that can work for you. Don't give up if the first idea isn't for you - keep going until you find one that is. Or better yet, find your own way and then share your success with others.